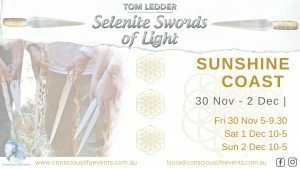 Welcome to the Conscious Life Events Australia-wide Events Listing Page! Email us to post your event. There will also be an Isis activation to bring in and clear the feminine lineage of the past abuses and the accumulated effects of lifetime after lifetime. We will be activating the new Diamond Light frequency of Love for each person. This is going to be an extremely important workshop for all light workers to attend. We need to bring our energy Matrix, and our ability to work inter dimensionally to a higher level of love and grace into our life and the planet. We will be working on elevating our chakras to a higher geometric function to assist in changing the world to a higher frequency and a higher light quotient.